We have been following the life of David. Many times, David ran away from King Saul who wanted to harm him. Remember the times when David could have hurt Saul? He didn’t. He wanted to leave that up to the Lord. David said repeatedly: “I will not lift my hand to destroy the Lord’s anointed.” David also loved Jonathan, Saul’s son. They became best friends and made a special pact together. They promised they would look out for each other and take care of each other's families. Saul and his three son’s along with the Israelite army had gone to war against the Philistines. You remember the Philistines. The giant, Goliath, that David killed was a Philistine. The Philistines have been raiding the Israel cities and hurting people. The battle was terrible and the Philistines were winning. 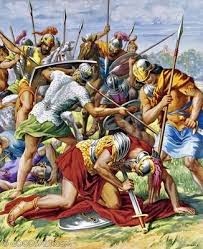 At the height of battle both Saul and Jonathan were killed. The Lord told Saul before the battle that he and his sons would be killed in this war and David would become the next king. The reason was because Saul had stopped trusting in the Lord. He didn’t obey God anymore. The Lord would place David on the throne—king over all Israel. David was not in this battle. A man from a different nation came to find David. He told David of the battle and he lied saying he had killed Saul. He said this because he didn’t know David and thought David would be pleased. He was terribly mistaken. David and his men with him were so upset they tore their clothes, which is a sign of mourning or anguish, a deep sorrow. They also fasted or did not eat until the sun went down. David was sad because of Saul and Jonathan and also for the nation of Israel to lose their king. That man who had come to David, had been bragging and lying about something he didn’t do. He made fun of the fact that the king had died. This was a terrible thing. David was sad and mourned for his dear friend Jonathan and the king of Israel, Saul. He wrote a special song for the two men and had other men memorize it and they sang it together. It is called a Lament. 2 Samuel 1:17-27 is where we can find the song. What can we learn from this story? One thing is that when anyone dies it's a sad thing. People who know them will mourn. We need to be sensitive to them at that time. We need to mourn with them. We should weep with them. David’s men tore their clothes and fasted right along with David. They felt his pain at the loss of Saul and Jonathan. Another thing form this story is that we should never tell a lie. The man who told a lie to David was slain. There are consequences to our actions. It was a cruel thing to brag to David that the king was dead. Something else we can learn is that even when someone is mean to us we should still love them. Saul was mean to David for many years. David still loved Saul. The Bible says we are to love everyone even our enemies. Memorize: Luke 6:27 But I say to you who hear: Love your enemies, do good to those who hate you.